A barge at the Staten Island Port Mobil terminal, owned by ExxonMobil Corp., exploded this morning at 10:10 a.m. EST. Reuters reported one person dead at the scene. As of noon this afternoon two other people were in the hospital and one person was still missing. The barge no. 125 is owned by Bouchard Transportation Company Inc. of Hicksville, N.Y., and was offloading 100,000 barrels of unleaded gasoline when the explosion occurred. 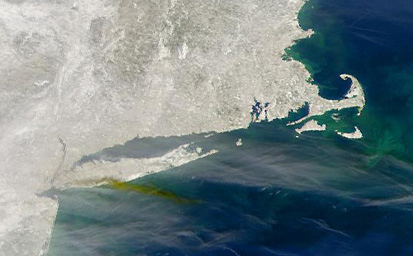 A smoke plume from a fire off of Staten Island today stretched about 150 kilometers to the east. Photo courtesy of SeaWiFS Project, NASA/Goddard Space Flight Center, and ORBIMAGE.